SHE'S half of one of the world's most influential couples - but until recently, Priscilla Chan has mostly stayed away from the spotlight. But thanks to a new, candid profile in Quartz, that could be about to change. The 33-year-old wife of Facebook CEO Mark Zuckerberg has revealed surprising new details about her childhood and family background, family life with her famous husband and their two young daughters - and how she plans to help change the world. Unlike Mr Zuckerberg, 34, Ms Chan grew up poor in a blue-collar neighbourhood in Boston. Both her parents, who are ethnically Chinese, fled Vietnam as "boat people" before their families settled in the US. "You literally put your children on a boat, say goodbye, and hope to meet them on the other side," Ms Chan told reporter Robert Safian of her parents' dangerous journey. "There are horror stories of families putting all their kids on one boat and it sinks, they lose their children." Ms Chan was also badly bullied as a child, and she attended a disadvantaged school described by a former teacher as "the city dump", complete with leaking ceilings and crumbling walls. Perhaps it's not surprising, then, that Ms Chan developed a passion for social justice at a very young age. "Giving back has been part of my life before I even met Mark," she explained to Quartz. She was also naturally brilliant, dubbed "class genius" by students at her high school and scoring a full scholarship at prestigious Harvard University. She ended up meeting her husband-to-be while waiting to use the bathroom at a fraternity party during her first year of study. 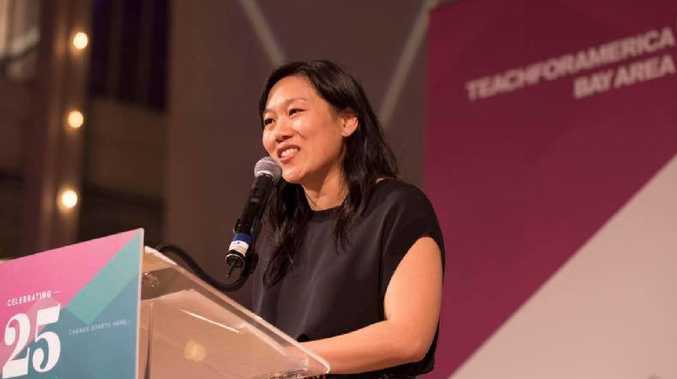 Her first job after leaving Harvard was as a high school science teacher, and she eventually became a paediatrician after studying medicine at the University of California, San Francisco. But that was just the beginning for the woman Quartz describes as "a doctor who has become a crusader". She joined a team of paediatricians helping underprivileged families, and helped launch a special school that "combines education and health care" for struggling kids in the poor suburb of East Palo Alto. And in December 2015, Ms Chan and Mr Zuckerberg, who married in 2012, publicly vowed to give 99 per cent of their Facebook shares - worth around $US45 billion - to the jointly-run Chan Zuckerberg Initiative (CZI). That organisation is dedicated to health and education, and Ms Chan takes her role as co-CEO very seriously - a good thing considering she manages CZI's annual budget of up to $US800 million. According to Quartz, CZI's goals include "to help prevent, cure or manage all disease over the next century" and to "remake public education, pursue far-reaching immigration and criminal justice reform, and support affordable housing". With a widely-reported net worth of around $US50 billion and as the wife of one of the world's most famous men, it's surprising that Ms Chan has managed to avoid making headlines for so many years. "Mark Zuckerberg is among the best-known figures in America, and indeed the world," Robert Safian wrote. "Chan has been more circumspect, reluctant to step into the limelight." But the reporter explained that after months of interviews and research, "what becomes clear is just how central Chan's influence has been on CZI, and on Zuckerberg himself". Despite their elite status, it seems the couple grapple with many of the same challenges faced by young parents across the globe. They told Quartz they worked hard to set aside "date nights" free from work talk. "We used to go out to dinner to talk about CZI one night a week, but that felt weird over time, because we also go out on dates," Mr Zuckerberg said. "So now we carve off time, like our one-on-ones. "And then when we're at the kitchen table with our kids, it's not like we're not talking about what's going on in our lives - that's weird too, you're not going to turn things off that are important and emotional - but we try not to go through logistics and details and stuff like that." Ms Chan also revealed her husband tried to teach Max how to code at age two - and that she turned to her paediatrician for parenting advice, even though she is one herself. Other revelations from the profile include the fact Ms Chan was tennis co-captain in high school even though she was a mediocre player, because she "knew how to motivate" - even convincing teammates to miss their prom when they had an important match the following day. It's been a tough year for Facebook, after serious data breaches made headlines, caused stocks to plummet and even landed Mr Zuckerberg before Congress. But Ms Chan remains defiant - and committed to doing her bit to help others. "Our skin has gotten pretty thick," she told Quartz. "The future is coming. You realise that you want to have this incredible world for your children. "And we knew we had an opportunity to be part of creating that incredible world."